The SLD Diesel sidelift vehicle provides optimum reliability and performance. High peformance with low noise and low emission diesel engines. The motor is enclosed under cover for protection and noise insulation. Options include dual pedal control for forward / reverse in place of the standard column mounted lever. A multi-function single joystick in place of individual finger tip controls for all hydraulic functions. The floor to ceiling windows offer exceptional visibility and where required are protected with a safety grid. 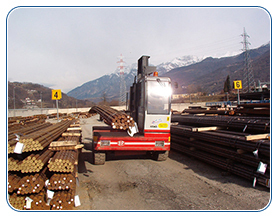 Automatice load stabilizing tilt system allows asset readjustement while traveling.